Hello All, sorry for the delay, but I’ve gotten a job which tends to eat up a good chunk of my normal sleep time, so sleep was pushed to my normal blog time. This will be changing quite frequently, so expect Blogs to be posted at pretty much any time of day, whenever I am able to. Also, if you notice on the right side of my blog, you can now view the thoughts I have on things and whatever else is feeding into my Twitter. On to tonight’s review: Gangster Squad. Being adapted from a novel, one would think it might try to be like the novel, however. From the director’s previous films, it’s actually something of a fun, popcorn flick. Giving us just enough of a plot and depth to keep us interested, but not driving off some people by being boring. Everything you expect from the trailer, you get in the movie. They could’ve gone hard R with its rating, or 18A if you’re in Canada, but no they went with the 14A rating in Canada, and as I call it, Soft R in the states. Being another MPAA oversight in terms of what’s acceptable to a PG13 audience. Granted there are a couple of shots that show some gruesome-ness, but they’re cutaway shots. I’m not really complaining, that’s just a point I want to mention, since the MPAA are stuck in the 1950’s sometimes. If I’m going to do a movie about war on a gangster, I would’ve said screw the MPAA, since they’re going to give me an R rating anyway, and I’ll go nuts with the violence and gore, more than we got. Granted it was quite a bit in the movie, but if there is an unrated cut with more scenes, or longer scenes, I’d probably catch that version. The movie is still worth your time and the 5 bucks you may spend on a Tuesday. With this out-of-the-way, as it’s just a minor point I have about the MPAA these days. On with the movie. The movie presents itself in a very stylish manner, which is nice to see once in a while. It wasn’t nuts with style and flash, it gives you more than the usual, but keeps itself grounded in reality with practical stunts and good camera work. Cars don’t go insanely flipping over like that of an action movie or science fiction, where you sometimes see a CO2 cannon mounted on the bottom of the car and we see a cloud of gas shooting out of the bottom to make the car flip in an insane way. In this movie, we have period correct cars, in action scenes where any flips or rolls, are not huge, insane effects, but just as they sound, a basic car flip, and roll. Which I like in a movie, giving it some realism. The actors do a hell of a job keeping us interested in the light story we’re given, and show us exactly what we’re supposed to see. Being a writer, I could spot certain instances where particular characters will be joining the fight, even if they previously said no. Ryan Gosling’s character is the one I mention, as we’ve seen his “inciting incident” in the trailer. *Spoiler* if you haven’t seen the trailer, but he previously turns down Josh Brolin’s character for special assignment to the Gangster Squad. We also know that he is very much-needed, as in one instance they make a terrible mistake making a move on a place of interest, and failing miserably. Then the inciting incident happens for Gosling’s character and his motivation to do something about the crime in the city and be an honest cop again kicks in. He then decides to join the squad, and the team is set. Brolin is an extremely talented actor, showing us that his character’s true colours are that of a fighter and a hero. Now when I say hero as a colour, it’s that instinct one has that says “I don’t like the world around me, things seem wrong, morally and I feel the need to change it.” Its the whole questioning part of one’s psyche. His wife objects to him being the ruthless cop he is, just wanting a quiet life. Kinda seems a bit cliché, but its the 50’s, what do you expect. Sean Penn is awesome as always, choosing his roles well and delving deep into them. He’s perfect for the role of Mickey Cohen. Not to mention everyone else in this movie. Even Nick Nolte, whom we can all tell is getting up there in years and his smoking has really done a number on his voice. The rest of the cast does great work, not to mention Robert Patrick’s character being something straight out of a western and does a hell of a job too. As the movie progresses, some character’s don’t seem to fit, at least with the general premise of the movie, as Brent thought Emma Stone’s character only seemed to fit as being the witness in the end, but I found she was the continuing drive or ambition for Gosling’s character to continue to work with the Gangster Squad, as their characters grow closer. In terms of this movie being style over substance, I don’t see it really, granted yes there is more style than substance, but it doesn’t suffer from it, like the critics say. Which is why it has that divide on Rotten Tomatoes. Audiences like it, while critics bash it, seems to be a theme with some movies. Granted it’s not like the live action Resident Evil movies which are really Style over Substance. I find if I want to watch another RE movie, I’ll watch the CG ones, like Degeneration and Damnation. 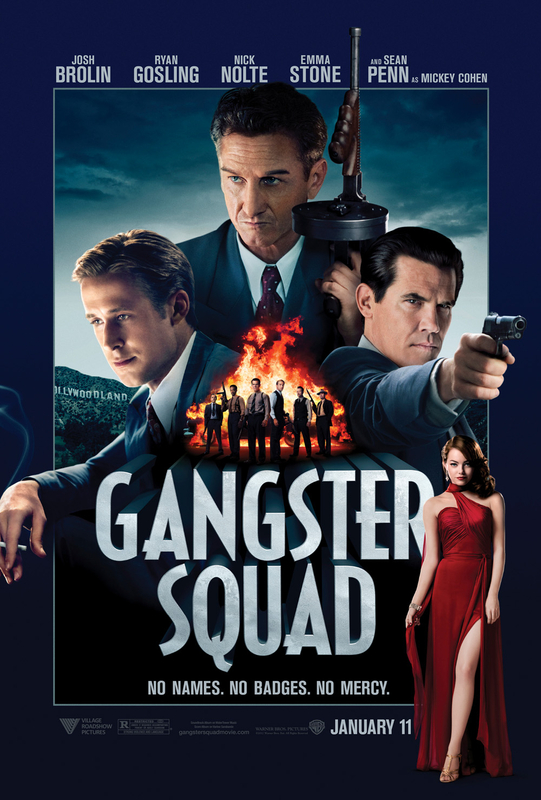 So in terms of Gangster Squad, I would say its a good movie, not a fantastic one. As I said to Brent in the theatre, if LA Confidential is AAA, this is a solid A. Definitely something to watch to be entertained. So give it a watch, also, there will be a review to “A Good Day To Die Hard” as I’ll be seeing that, since I’m a Bruce Willis fan, after all.